S-10 Forum > Truck Of The Month > Truck Of The Month Winners > June TOTM Winner! This months winner is YAIMLOW, here is a little bit more about his truck! Special Thanks to Dan, Jesse, and Marshall for the helping hands in the garage, and to Sairene for spending the long nights in the garage with me! wow man...... envious is an understatement... i love it beautiful work, its all in the details and from the looks of it u nailed it! good job! this truck is sick, followed the winter build and it was awesome, should post up some pics of your interior, just epic!! thanks a lot guys! i was shocked that i got voted totm! yes im also glad im on high land so i didnt get sucked into the flood! the water is still that high. and 90blues10, the gap you are talking about is just because i have to change the rad support because its a grill for a newer s10. should be changed up in a few months. i will post some pics of the interior right away! thanks again guys! insanely nice truck, gotta love that scoop sticking out of the cowl! 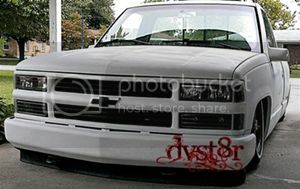 thats actually my cousins old truck but looks killer!! thats one awesome truck man, props. only thing that i even saw that i dont like is the camber in the front, does it sit like that when ur drivin? Nice truck man looks killer with the irocs ! Damn, man, I can't get enough pics of this thing. Beautiful. those irocs do set it off! Who picks these? Nice color,rims are horrible. Looks like IROC rims made out of foreskin, rub them and they grow. I dont get the lowering thing,proves that taste is all in the mouth. Sorry dont like it. The members of the site pick them. congrats man, i have actually had pics of your truck as my wall paper haha. never even seen your build thread. Sweet......Love the IROCs! Love the color! PROPS DUDE!!! Maybe if it was pink you would like it better???? Nice truck man, a lot of wrenchtime put in it that's for sure. Congrats on totm, well deserved! thanks a lot sidearmbandit, jopre, i cant beleive you had my truck as your wallpaper, never honestly thought i would have a "wallpaper worthy truck" lol thats awesome. nedzodildozer... thanks for the input, but if you dont "get the lowering thing" what are you doing in this thread? does it look like its lifted? nope, so no need to be in this thread huh? so hop in your stock truck and be on your way... anyway, thanks for all the compliments guys! feels good to have a truck on the home page for a month! thats one sweet sdime, i actually have a pic of this truck saved to my lock screen on my phone. lmao! Been my wallpaper on my phone for about a month. Inspiration for my 88 that's sitting on 15" irocs. Hahaha. I love it- and you totally deserve TOTM... with all the work you have put into this thing. Its awesome that you built something you are proud of man... congrats! Awesome! Great job! I like it! that is one bad *ss 1stgen. Do you have a build thread for it? why hasnt there been any TOTM lately? Congrats on the TOTM!!! Well deserved, nice ride!!!! 91 S10 2.5l, auto, Sheved door handles and suicide hood... Pro street treatment in the works!! !